How Much Is Your "Trime" Worth? America's three-cent coin is a curiosity of history and government. Sen. Daniel Stevens Dickinson (D-NY) proposed a bill to lower the postal rates from five cents to three cents. He wrote a bill, authorizing the issue of a three-cent coin in high-grade billon (75% silver, 25% copper), which was passed on March 3, 1851, with an effective date of June 30th. The new coin weighed 0.802 g with a diameter of 14.3 mm (9/16 of an inch). This extremely small coin earned its nickname of "fish-scales." 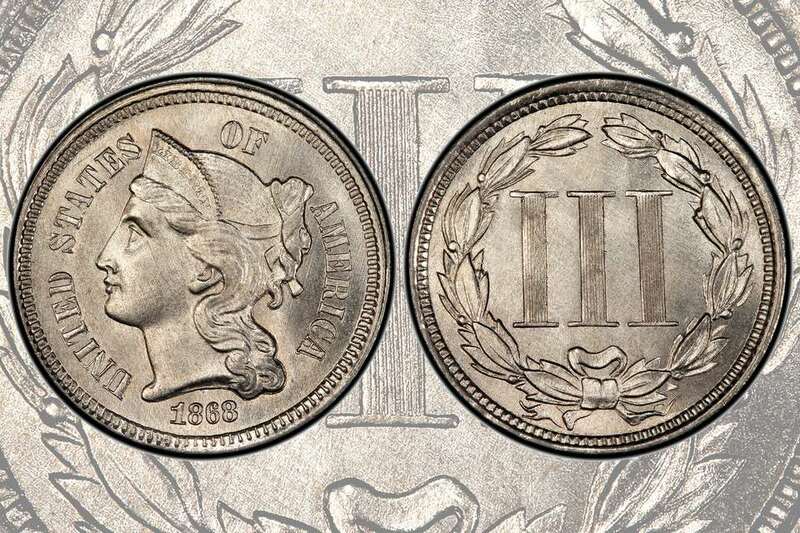 History of the Three-Cent Nickel "Trime"
In the closing years of the Civil War, the American public was still hoarding silver coins because of the uncertainty of the outcome. This practice would continue long after the end of the war and through the reconstruction period until 1876. All silver coins were quickly removed from circulation as soon as they entered. This ritual even included the extremely small silver three cent coin. In March 1865, Rep. John Adam Cayson (R - IA) introduced a bill to produce three-cent coins with a composition of 25% nickel and 75% copper. These new coins would be slightly larger at 17.9 mm and weigh 1.94 g. This bill was the result of Joseph Wharton's pressure in the United States government to purchase nickel from his mining interests. Designer and engraver James Barton Longacre resurrected a liberty head with a cornet and ribbon (same design from experimental cents and quarter eagles from 1857) for the obverse. He placed the Roman numeral III within a Laurel wreath on the reverse. These designs remained unaltered through the end of the denomination in 1889. Early production figures over the first decade were fairly ambitious. Over 11 million coins were produced in the very first year of its issuance in 1865. When collecting examples of United States three-cent nickel coins, make sure you select coins that have been struck well. On the obverse, check the hair and other portrait details to make sure they are sharp. On the reverse, pay attention to the vertical lines that make up the Roman numeral III. The lines should be crisp and well defined. Check the dent Nickels on both sides of the coin making sure they are well defined, also. Many coins of the 1860s and 1870s have at least one area of weakness on either the obverse or the reverse. The United States Mint produced all coins at the Philadelphia Mint location. Therefore mint marks were never used on this coin. Buy price is what you can expect to pay to a coin dealer when you purchase the coin, while sell value is what you can expect to receive from the coin dealer if you sell the coin. Buy price, and the sell value for an average circulated, and average uncirculated coins are also presented. These are approximate retail prices and wholesale values. The actual offer you receive from a particular coin dealer will vary depending on the actual grade of the coin and some other factors that determine its worth. How Much Is My Liberty Head "V" Nickel Worth? How Much Is My Silver Roosevelt Dime (1946-1964) Worth? How Much Is a Shield Nickel Worth? How Much Is My Flying Eagle Cent Worth? How Much Is My Silver Washington Quarter Worth? How Much Is My Barber Dime Worth? Do I Have a Valuable Indian Head Penny?